Hotel Capitol , 3 stars of Misano Adriatico, it has a garden, a panoramic terrace with jacuzzi and solarium, many services for children, WI-FI and free parking. Admits animals, on request. The structure is in Misano Adriatico, less than 5 minutes walk from the beach and in front of the Parco del Sole, a green area with games for children, funfair and events for the whole family. They have a balcony, air conditioning, telephone, safe, satellite TV and digital terrestrial, WI-FI, private bathroom with shower and hairdryer. Upon request, minibar and sea view. Garden, panoramic terrace with solarium, Jacuzzi and fitness area, free use of bicycles, reading room with newspapers in consultation, lift, theme nights, welcome aperitif every Saturday and Sunday. PARKING: uncovered and free, available for everyone. CONVENTIONS: beach, amusement parks, organized excursions, shuttle service on request. SERVICES FOR DISABLED: ground floor entrance, standard elevator, room with wheelchair maneuver space, accessible shower. BREAKFAST: international buffet breakfast with homemade desserts, cakes, croissants, yogurt, cereals and cold cuts. LUNCH AND DINNER: 4-choice menu with meat and fish dishes, vegetable buffet, pasta and homemade desserts. VARIATIONS: vegetarian cuisine, for celiacs on request. OTHER: once a week the kitchen offers typical dishes of the Romagna tradition and a Gala dinner. In hotel: baby / mini / junior club, live entertainment, indoor and outdoor playground area, strollers, bicycles with child seats. On request: baby sitter and pediatrician. In the room: beds with rails and cots. At meals: flexible hours, bottle warmers, baby food, baby menu, seats at the table. At the beach: mini club, games, entertainment. 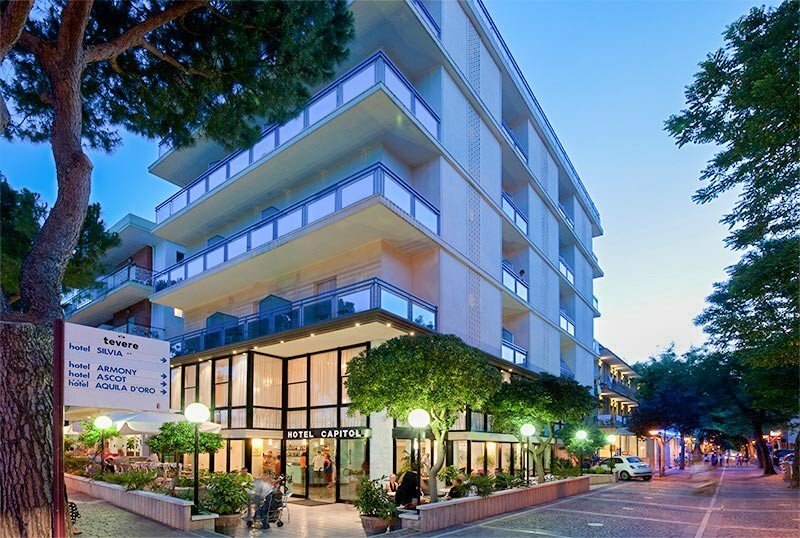 Hotel Capitol has an agreement with Bagni Margherita and Calypso, where guests find cabins at their disposal, sports fields, mini-clubs, games, entertainment for children.